1. This is a contest for pairs (couples), meaning: M&F, M&M sau F&F. 2. Minimum age is 16 years old. 3. You will perform two dances with a maximum duration of 2 minutes per song. 4. Choosing of the songs will be made on the spot by drawing lots. 5. Scoring criteria are: musicality, musical interpretation, technique, degree of difficulty, the connection between partners and timing, originality, stage presence. 6. The performance must contain minimum 70% Salsa steps. 7. Are accepted any lifts, tricks and acrobatics designed to make the show spectacular. 8. You can enter the competition only if both partners have bracelets / Passes valid for that day. 9. Registration dead-line is July 10. 10. The participation fee is 50 Lei / pair. 11. Once the competition started, the partners can not be changed. 12. To register, you have to download and fill the Registration Form below, and have proof of payment of the participation fee and copy of ID card. 13. Rank 1 is rewarded with the amount of money gathered from all registration fees, plus the title “Best Salsa Freestyle Romanian Couple” and gifts offered by Romania Salsa Week Festival organizers! 6. The performance must contain minimum 70% Bachata steps. 13. 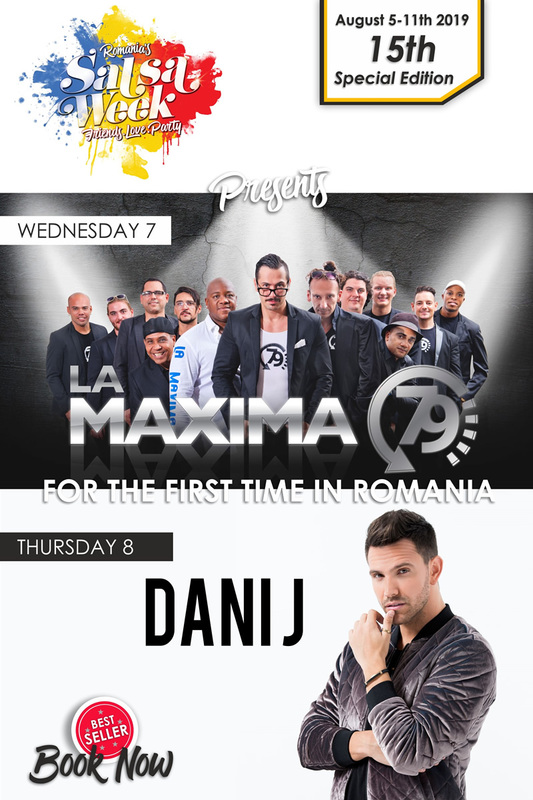 Rank 1 is rewarded with the amount of money gathered from all registration fees, plus the title “Best Bachata Freestyle Romanian Couple” and gifts offered by Romania Salsa Week Festival organizers! 6. The performance must contain minimum 70% Kizomba steps. 13. Rank 1 is rewarded with the amount of money gathered from all registration fees, plus the title “Best Kizomba Freestyle Romanian Couple” and gifts offered by Romania Salsa Week Festival organizers! The contest is organized by the Romanian Dance Association and is being held at the International Festival “Romania Salsa Week”. Participants in the contest are required to comply with the terms and conditions of the Official Rules, as outlined above, hereinafter referred to as the “Official Rules”. The Official Regulation is prepared and will be made public on the www.salsaweek.ro website and on www.facebook.com/salsaweekromania. The contest will take place on Thursday at 22:00 at the D’OR Complex in Vama Veche and will be held in accordance with the provisions of this Official Rules. By registering to this competition, all competitors give up their copyrights over the recording during the competition. The organisers have no responsibility for any accidents during the competition, accidents caused by an unhappy performance of the dancer, this responsibility being taken by the couple’s representative. The panel of judges will have 4 or 5 specialists named by the organiser. All decisions are final after solving the eventual appeals and will be announced by the president of the judges’ panel. The appeals can be made in writing at the address of the “Asociatia Romana de Dans” or at the e-mail address romaniasalsaweek@gmail.com in maximum 48 hrs after the end of the competition. Other means of appeal will not be taken into consideration. The decision of the appeals will be announced in 14 calendar days from the date of the appeal. The judges have the right to confer and deliberate on the final scores after all the scores have been given. The president of the judging panel, with the approval of all judges, can modify the scoring, only in case there is a big difference between the points given by each judge to the same competitor. Only after the competition is finished, the judges can talk to the competitors about the decisions made and the competitors can access the judging sheets (their own sheets, and not the other competitors’). Judges should always maintain neutral and professional. Competitors will be allowed to see their scores after the end of each round but not allowed to talk to judges until after the finals of all the competitions. Competitors in no way will be allowed to raise their voice or be unprofessional to any judge or member of the organisation. If this is to occur the competitors involved will be disqualified. The judges will have the final decision on ALL discrepancies, equal scores, etc… All decisions are final. Couples will demonstrate their ability to creatively work with the timing of the music. This can be done in a variety of ways, including patterns, footwork,” hits”, tricks, etc…Judges will evaluate the level of interpretation of the music, the different nuance, breaks and accents the overall synchronisation of the dancers with the music. The judges will evaluate the originality of the moves, combinations, footwork, etc. of the dancers. Reflected through balance, placement and lines. Partners must reflect adequate “Latin” / “African” “motion” and “isolations” as designated by the dance style. Movement should appear to be effortless. These are reflections of good dance technique. What was the level of the turns, patterns, intricacy of shine movements, level of tricks, dips, drops, etc.? The amount of turns on both double and single feet? By both dancers or only one? Any movements requiring exceptional balance, flexibility or strength? Were all movements attempted successfully executed? How professional and polished did the couple appear to be? How did they project to the audience and capture their attention? Contestants will show etiquette during the competition by refraining from distracting others during the competition. If this is not the case the judges will deduct points. All winners will be validated after counting the scores on the judges’ sheets. The team with the biggest score will be declared the winner of the competition. First place: “Best Salsa Week Team” Title, the qualification at the World Latin Dance Cup, Orlando Florida, USA, 500 EUROS, diploma and a cup. The competition is open to all dance lovers residing in Romania and abroad, expect the judges and the judges’ family members (children, brothers/sisters, husband/wife). The awards ceremony is a public event. Participating at this competition is considered the approval that the winners names, fotos and the materials made as required can be published and used free in audio, foto and video materials by the organisers. The winners of all the awards agree to sign a written agreement stating the above, as required by the organiser. THE REGISTRATION FORM WILL BE FILLED IN THE WORD DOCUMENT, AND SENT TO: romaniasalsaweek@gmail.com. YOU ARE COMIMITED TO SIGN THE ORIGINAL DOCUMENT AS SOON AS YOU GET TO THE EVENT. The organiser undertakes to comply with the provisions of Law no. 677/2001 regarding the protection of personal data stored during the contest. As such, the organiser is committed in keeping safe the privacy of the participants / winners of this contest and use them according to the Official Rules and legislation. The participants in the contest, as the persons concerned have, according to Law 677/2001, the following rights: the right to information (Article 12), right of access to information (article 13), the right to modify the data (Article 14 ) and the right to oppose (art. 15). Simply contest and sending personal data to the organiser, participants agree to their data into the database of the organiser to be processed and used in the future solely organiser to inform participants about the new competitions and other information concerning efforts to promote dance and organiser of the festival.